It's official! My favorite nail polish of the summer for toes is L'oreal Nail Polish in Mango-get-em. It's a gorgeous coral-ish orange shade that really feels summery, and I think it's especially cute on the toes :D I mean it's got to be good if it prompts me to post a picture of my foot on my blog! Yes it's pretty, but it's practical too. When I wore this on my fingernails a couple of weeks ago, it remained chip free for quite awhile- and the same is proving to be true on the toes. Another great thing of course- it's available at the drugstore for just a few bucks! OMG everyone! Tyler leaves to take the bar exam tomorrow!!! :0 The testing will happen over the course of Tuesday and Wednesday. Please keep him in your thoughts/prayers. In case you're not familiar with it- this will probably be the biggest test of his life... now that he's graduated from law school, the bar exam will certify him to be a lawyer. Tyler is the type of person who remains pretty calm, cool, & collected regardless of the situation... but this afternoon I can see that he's stressed. I truly believe he will do well, and I think deep down he thinks he will too... it's just an intimidating and kinda scary process so keep your fingers crossed for him! I'm eating a salad right now. Yep I'm making a committment to eating very healthy this week and keeping my exercising up. I always feel better when I get in that routine, but I am the type of person who craves nachos, candy, and all things "junk food". I'm not going to deprive myself of those things, but I'm going to reserve it more for the weekends and keep it healthy during the week. On another note, the other day I was imagining life without makeup. I really think it would be so boring! 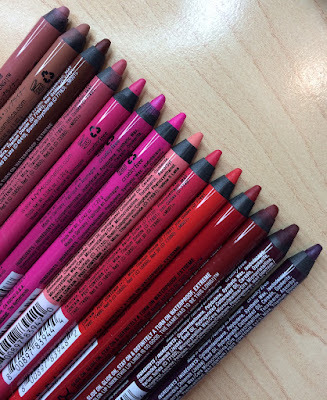 I got to thinking of how much I enjoy makeup- not just for the confidence boost, but for the fact that it's an outlet for art and creativity! 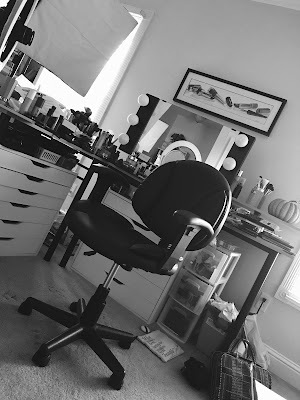 When I'm sitting at my makeup area, I'm in my "happy place" and I'm so lucky to have so many others online who share my love and passion for it! Have a great week everyone! Good Luck to Tyler, keeping him in my thoughts. I'm sure he will do great. Definitely keep us posted on how things go Emily. Cute color, I will have to look for that one on my next shopping trip. the nail polish color is soo cute. good luck to your husband. i hope he passes!!! i need to start eating healthy too. i had cake for breakfast and a glazed donut before lunch..ughh sooo badd! I hate that even having to finish Law school (or any school - medical, pharmacy...) you still have to take a big old test at the end. Not just any test - one that determines if you'll make it or not! It's like, I thought getting into those schools would be the determining factor but I guess not! Hi Emily! Sending good luck to Tyler for his test. He will do fine! Best of luck to Tyler! Sending pozzie vibes all the way from Australia to him! p.s. I love that colour, I will have to keep an eye out for it. The polish color is so cute! Keeping Tyler in my prayers! Good luck! I love that nail polish color! My favorite combo for Summer is China Glaze's For Audrey on my toes and any bright yellow polish on my fingers. It reminds me of a pretty Summer day :) And good luck to Tyler! Love that nail polsih... i will keeps my eye out for that nail polish collor. I also wanted to wish Tyler good luck on his big exam! We all know Tyler will do well... and even if for some reason he did not pass - he can try, try again. Just look at the number of times JFK Jr. took the bar exam (three times - several people take it multiple times)... Anyway, you know what they say - 'behind every great man... is a surprised woman.' Just kidding kids - plan something great for him when he passes - you both will deserve it!! !